You hate to start a blog with the words “consult your physician” but in the case of edema it becomes a necessary part of health and wellness.Edema is a term used to describe fluid buildup in the body’s tissue from the lymphatic system. Often the most common seen is that from an injury or trauma that has caused swelling. However, some health conditions will have a symptom of swelling. Some medications carry a symptom of edema. Therefore, having your physician’s approval before exercise is for your wellbeing. The principle organs of elimination involved in the lymphatic system are the kidneys, spleen, intestines and liver. Once an area exceeds its fluid balance you see the body begin to change. The lymphatic system primarily moves with hydrostatic pressure and all the more reason to get in the pool. 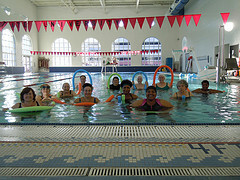 Aquatic exercise works with the water to encourage movement. Decreasing the gravitational pull on the body would have some thinking that fluid would increase or not move at all. However, the hydrostatic pressure of the water on the body’s tissue decreases the edema. Exercise encourages the body to eliminate the fluid buildup. Any exercise that supports the lymphatic system is a great one to do in the pool. Allowing the legs to go through a series of flexion, and extension or going up and down on your toes is beneficial. Water walking in three directions – forward, backwards and sideways is great as well. Walking in the water like a wooden soldier is beneficial for lymphatic return. All of these actions work with venous return of the vascular system which in turns encourages the lymphatic system to eliminate the excess fluid. Becoming sedentary can add to the fluid buildup. Jump in the pool this spring and summer. Give your body what it’s asking for which is to move. What better way to move than in the water. Thanks for this unique insight on battling edema. Many people would not think of getting into the water with this condition. Water has so many benefits that people do not know. That is true Bob. Thanks to this blog hopefully this message will find it’s way to someone who needs it.